Your acceptance at Alexander Circe’s Academy for the Study of the Esoteric and Eldritch Arts ushers you into an elite fraternity of wizards and witches who protect mankind against creatures from the Shadowrealm. You will learn skills you thought were only available in faerie tales. But you will also learn the responsibility of those arts is more than any normal mortal has ever held. We will teach you how to defend yourself and others from horrible creatures beyond imagination. We will also teach you how to protect yourself against warlocks: those who have broken the Magical Vow and now practice the dreaded Dark Arts. Welcome to Circe’s. Your life will never be the same. 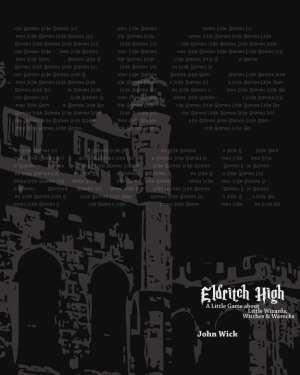 Eldritch High: A Little Game about Wizards, Witches and Warlocks is available at RPGNow.com. ← Vampire: the Masquerade 20th Anniversary Edition eBook is available now!